I embroidered my digital design today and created a Mug Rug for my coffee. The size of the embroidery file was 5" wide by 4" tall. I ended up making the size of the mug rug to be 6" wide by 5" tall. At first I thought the size would be too big, but now I love it. 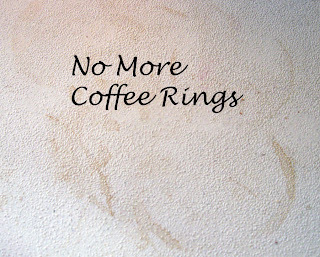 I don't have to be soo careful with my cup of coffee to make sure it is on the rug. I will share the file sometime later this weekend but wanted to try another prototype to fix some issues I came across. I also decided to remove the green outline to the lips. I changed it back to red. I started with the threads and background fabric. 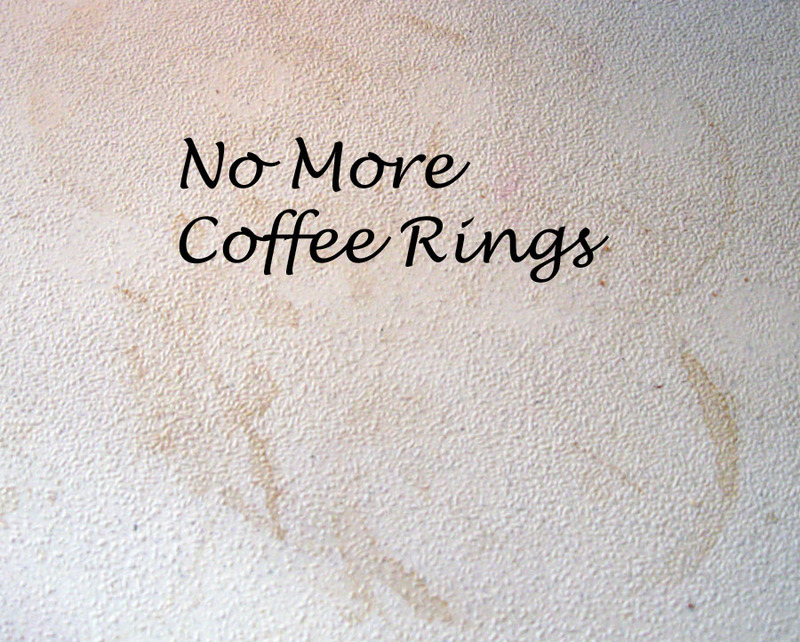 I decided to make my mug rug black to hide all the coffee stains that will probably come in the future. You see, this is what my area next to my laptop usually looks like after a morning of 3+ cups of coffee. 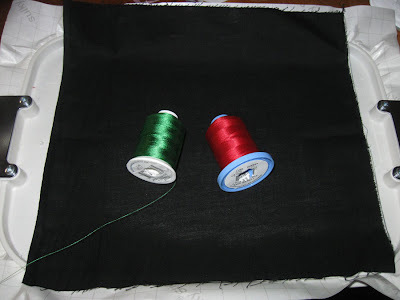 Once I had the black scrap of fabric, I found the perfect shades of Kelly Green and Red thread to go with the design file. I never use the thread colors in the file. I manually find the shades I want and then assign them to the areas of the design on my embroidery machine. I used a sticky back stabilizer and just pressed the black fabric scrap on it. I made the black fabric large enough to be cut back to my chosen size once the design is stitched. The embroidery file was stitched out and I saw some minor issues. One of the issues made me chuckle. It seems my lip liner was on crooked. It was way to high. Don't we always put our lip liner on crooked? That's why I don't wear it. Also, the font stitch out was not the cleanest. But, I'm OK with that as well. I snipped several areas of stray threads. I'm saying this because I want you to know the stitch out is not super professional. I'm not a full time digitizer. Once the embroidery file was stitched, I cut the fabric to size and created the standard quilt sandwich. I then machine stitched on some premade moda binding with the sewing machine all around. It was not perfect but I made it work. I didn't want to have to sew the binding by hand on the back. And now, my morning coffee will look like this! 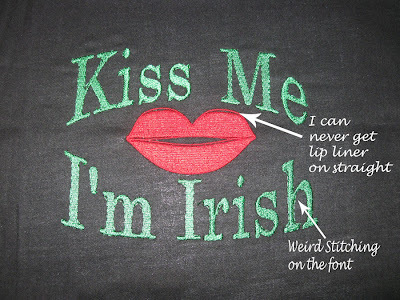 Hey, does that say I'm Irish or I'm Trish :-) I want to stitch out the file again after a few tweeks and then I should have the file available by the end of the weekend for download. I LOVE this. I'll be watching for the embroidery file. 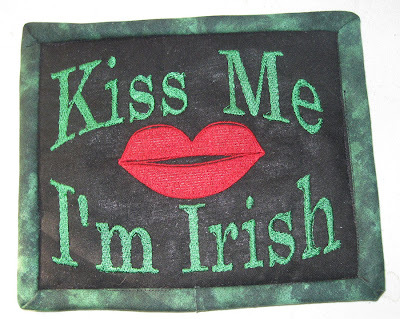 We have a good friend who is Irish and VERY proud of that fact. She celebrates almost the entire month of March and in fact, her birthday is this coming Tuesday also. This would be awesome for her. She'd love it. It looks great so far.